*Edit* I am by no means upset by my exclusion from this group. I AM upset that when I questioned the appropriateness of Melissa acting in the capacity of admin and gave my reasons why my comments were deleted and I was blocked (see silenced). I figured if they wouldn’t give me an answer in there (and everyone else who wanted to know) I’d ask them here and let the information be public. I also think the rules should apply to ALL. And they don’t. I have been a member of a mixed adoption support group for a couple of years by the name of “Domestic Adoption Support Network” on Facebook. The group was apparently created by a man named Tim Elder and recently added an admin by the name of Melissa Kay Robinson (or just Melissa Kay or just Melissa Robinson). This is the story of why I am no longer a member in this particular group, along with many other adoptive parents, adoptees, and first parents. This is the story of an intricate network to market adoption and mine expectant mothers under the facade of a “support” group. I can quite honestly say that I’ve never seen anything like this during my time in adoptionland. It’s very cunning yet quite alarming. If you don’t have some time to read I suggest you save this story for another time, but do save it. It is not only worth the read, it would be negligent if you didn’t. Hold onto your hats as we pull the curtain on “Domestic Adoption Support Network” and show you what is really going on. “A community of domestic adoption advocates supporting adoptive families and birth mothers. GROUP RULES: This is a domestic adoption support group which is moderated by Tim Elder of InfantAdoptionGuide.com, Tawnya Wallace McPhetridge, Andrew Finch and Melissa Kay Robinson. Facebook Support Group Rules of Etiquette: We are a community that has come together because of our mutual interest in domestic adoption in the United States. As we all know, adoption is an emotional topic that can bring strong feelings and emotions. This support group is a safe place to share our joys and concerns and to learn from each other. This requires trust and respect, so here are our group rules. 4. No personal attacks. No name calling. Period. It is OK to disagree with someone, but do it respectfully. Remember to re-read your words to make sure they don’t feel like a personal attack. It is NEVER acceptable to put down another person or call someone a name. Ever. 5. Don’t wear your feelings on your sleeve. Someone can disagree with you and it isn’t an attack on you personally. They simply disagree. No need to take offense. 6. Assume people have good intentions first, unless they prove otherwise. If someone is being rude and had bad intentions, report this to the admins. 9. Sharing of adoption pages vs direct advertising. While we encourage links to adoption pages and the sharing of personal insights into agencies, useful products, etc. this forum is not to be used for direct advertising of any form. If there are questions or concerns, please notify the admins of this group and we will handle it. 10. We want to keep this forum free from fundraising solicitation posts – offers to host parties and links for people to purchase your tshirts, mugs, etc. I will make 2 documents in the files section where you are free to add your services & your fundraisers if you would like. If someone asks a question about fundraising you may, in the comments, like to ideas you’ve done etc – but not as original posts. We don’t want this group to become overrun with these sorts of posts. There are other FB groups that focus on fundraising that you can join. Let’s start by looking at one of the group “owners,” Tim Elder. According to his LinkedIn page, he doesn’t have any kind of formal adoption training. He isn’t technically an “adoption professional.” It just states under the “also knows about” section, “adoption.” He got his degree from DeVry University in Chicago. Being from Chicago, myself, I know that doesn’t mean much and it’s a for-profit technical school that advertised heavily on the television. My childhood and teenage years were inundated by these cheaply made, annoying commercials. Even by his own admission he isn’t a professional. He has a little “book” called “7 Steps to Domestic Infant Adoption” and in the very beginning he states, “I am not an adoption professional. Any advice or resources given in this guide are based on my opinion, research, and experience.” Yet he feels he is enough of a “professional” to also advertise and conduct his own “podcasts” called “Infant Adoption Guide” and run a “support” group on Facebook with thousands of members representing many different walks of life within the adoption community. What exactly is Tim’s qualifications in adoption? Oh, he’s an adoptive father. He’s got some adopted kids that he adopted when they were infants. While he would certainly be a valued opinion to other prospective adoptive parents trying to navigate domestic infant adoption, this hardly qualifies him to coach and navigate the many complex aspects, psychologically and otherwise, aspects of adoption in a support group. He even sells an e-book on Amazon for his “Infant Adoption Guide” that you can buy for 99 cents! In fact, if you head on over to his website you can get his four FREE e-books for subscribing to his mail list as well as get his free videos! To Tim’s credit, at first glance it doesn’t appear he is making a WHOLE lot of money off of adoption (although I could be very very wrong). But he is making, at least, some. I subscribed to his email list to see what comes through and I’m pretty sure I’m going to get third-party advertisements that he is compensated for. If I’m wrong then I’ll apologize but considering that Bethany Christian Services pops up as one of his “new” sponsors it’s a safe bet there are several and they are all in the business of profiting or making a living off of domestic infant adoption. And let’s not forget that a “sponsor” is someone who pays you. Tim profits from adoption. Edited to add: It appears Melissa’s agency, Chosen Child, was or is a sponsor of Tim’s adoption venture. I could go on and on about Tim, and while I take issue with what he’s doing there is a bigger picture. He is part of that bigger picture and that is why I’ve given you some information about him but we must move forward to get to where I’m taking you. Let’s talk about new admin, Melissa Kay Robinson. 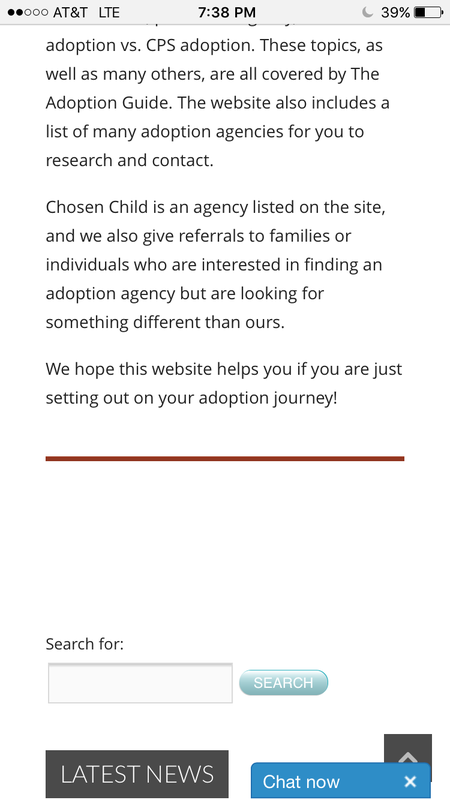 Melissa is the admin of this mixed group yet she is only connected to adoption in the capacity that she once owned her own FOR PROFIT adoption agency (now defunct, not sure why) and is currently the administrator for the adoption agency Chosen Child Adoption Services. According to her LinkedIn profile she holds a LCPA (social worker). She has no mention of her now defunct FOR PROFIT adoption agency on her LinkedIn page as past experience. I also find it interesting she is a member of the American Pregnancy Association considering she makes a living finding babies for people who want them. It’s also laughable to me that her LinkedIn profile says: Causes Melissa Cares About and “Children” is the only thing listed. Hmmm. I digress. So what I’m seeing here, reading between the lines, is that Melissa’s friend got pregnant at an inconvenient time and almost bought into the whole “your baby deserves better” thing and at the last minute came to her senses, breaking those poor PROSPECTIVE (Melissa fails to use the word “prospective” when telling her story. They are already adoptive parents in her eyes) adoptive parents’ hearts. Melissa then watched a single mother struggle so she decided to dedicate her life to “assisting” those with unplanned pregnancies (but I see “convincing them adoption is best”). Notice Melissa also calls her “friend” in this story a “birthmother” when she isn’t and never was. She makes no effort, whatsoever, to avoid language that could possibly be considered coercion, when counseling expectant moms considering adoption, but she’s the administrator of an adoption agency. Anyway, this is just what I’m seeing when I read this. It isn’t very well written so perhaps that’s not what it means but given her lack of education in today’s world of adoption about coercion and using correct labels for people (expectant mother vs. birthmother, hopeful adoptive parents vs. adoptive parents) to avoid coercion I will say that I think my gut is right. Melissa doesn’t advocate for what’s best for families. She advocates for what’s best for her pocket-book. Melissa doesn’t pay her bills without adoption. Adoption doesn’t exist without healthy infants to give to people willing to pay tens and thousands of dollars for them. You do the math. How convenient. A “maternity home” that functions as a residence to “help” pregnant girls and also opened up their own adoption agency to sell adopt out infants for tens and thousands of dollars. And Melissa Kay Robinson heads the adoption agency as the administrator (remember this is in addition to her $83,000 dollar a year personal business selling home studies to hopeful adoptive parents). Now, here’s the kicker. I don’t know exactly how much Melissa makes with Chosen Child since they are under Promiseland Ministries as a non-profit. Her specific salary isn’t listed on the Form 990 because of this. Again, how convenient. Feel free to visit the hyperlink to view the Form 990 yourself to see how much Promiseland has in assets and what their profit margin is. Just a thought. I wonder if Melissa recommends her own business conducting home studies to hopeful adoptive parents that come to Chosen Child. Did I mention she admins a group of over 5,000 people connected to adoption that has many expectant mothers considering adoption within the group and controls the content of what is shared in that group by silencing those who dare say anything bad about adoption? That might explain why Melissa advertises her adoption agency on multiple Facebook pages. Oh, and I almost forgot how Chosen Child Adoption Services had a case that went already to the Supreme Court (against them) for (surprise surprise) adopting a baby out without the father’s permission. READ THAT HERE. Where was I? Oh there’s just so much to tell you. So the other night someone asked how American Adoptions was as an adoption agency in that support group, Domestic Adoption Support Network. Lots of comments came in. Many from people who adopted using their services and had great things to say about them. Some adoptive parents chimed in about a friend who did not have a good experience as an expectant mother when she changed her mind about adoption. Melissa was sure to chime in and let everyone know that ONLY FIRST HAND EXPERIENCE AND KNOWLEDGE IS ALLOWED WHEN TALKING ABOUT ADOPTION PROFESSIONALS. Yet, when people were saying “my friend used them and said they were great” Melissa had nothing to say. Apparently that was allowed. And asking her to clarify the rules or enforce them equally ended with people getting kicked out of the group or chastised. When I pointed out that Melissa was adminning a support group where her only connection was as the former owner of a for-profit adoption agency and the agency administrator of Chosen Child my comments were deleted and I was removed and blocked from the group. Enjoy some screen shots of what Melissa, the “adoption professional” has to say within this group. And here is an example of a totally different thread, a “positive” second hand review of an agency and nothing was “policed” and this comment remains to this day. Then other admins chimed in. And then she blocked me so I just logged into my other account and messaged her what I really thought. Don’t say I didn’t give her the chance to defend herself. But what does Melissa think about the discrepancy in the enforcement of the group rules? You know, policing people who share negative second hand knowledge but not “positive” second hand knowledge? I would dig through hundreds of screen shots but just trust me when I tell you that she feels that only second hand positive knowledge should be allowed because it doesn’t “hurt” any adoption professionals. Negative second hand knowledge should NOT be allowed as it may hurt adoption professionals. Seriously. That’s what she said. I’m not joking. But I thought she was just “going by the rules.” And as you can see, because I shared the group’s rules, nowhere does it distinguish between negative second hand reviews of adoption “professionals” and positive reviews of adoption “professionals.” You’re just not allowed to do it. To some people this may seem petty. But it points to a larger picture. It points to a picture of being censored from telling the stories, even if you know the person personally that they happened to, that shows the tactics adoption agencies and attorneys will go to in order to facilitate an adoption. There are women in there who are considering putting their babies up for adoption and comments are being deleted and the ugly side of adoption, and which agencies to avoid quite frankly, are is being censored. Is that really giving someone an “informed” choice? Of course it isn’t. What in the world would these admins in this “support” group have to gain by not allowing these stories to be told? Well, I think I’ve made it very clear why Melissa has a problem with it. I’ve never seen policing like she has done in that group. It’s quite Gestapo. Remember Tim? We talked about him a little bit in the beginning. In another thread totally unrelated to the subject of this post he talks about his podcast. Notice the reference to American Adoptions. The subject matter of this post and the extreme censorship of anyone saying anything bad about them or their ethics. Hmm. In another comment someone talks about how American Adoptions has their own Facebook group. Well, this explains a lot more why no one was allowed to talk about the horrible things American Adoptions have done. 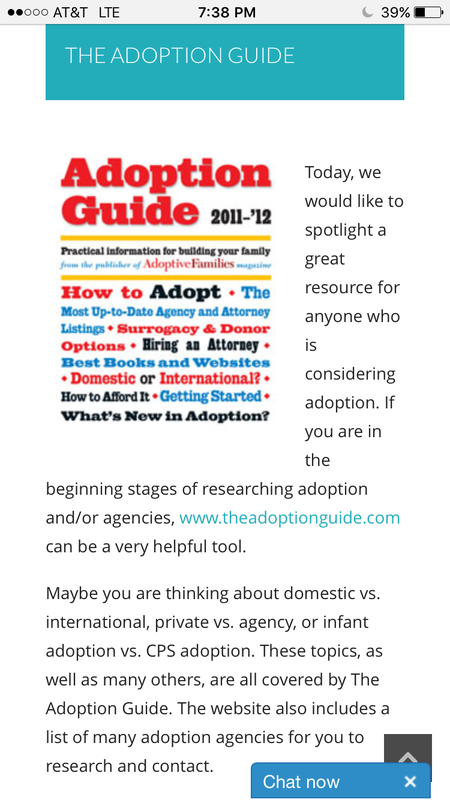 Is American Adoptions a sponsor of Tim Elder’s Infant Adoption Guide? Are the two groups working with each other? What exactly is going on here? Where does this leave us? In a TERRIBLE breach of confidentiality and trust. Support groups should be for support. Not for adoption professionals to police. Not for people to potentially mine expectant mothers to exploit them to make money in their adoption profiting business. Not for adoption professionals to snoop and change tactics in order to better coerce mothers based on the stories shared in these support groups. Anyone who chooses to remain within this group should be warned. Everything you say, every story you share, every detail you divulge about yourself can be used against YOU or someone else. Someone very vulnerable. I always get so irritated when I hear hopeful or adoptive parents complain that there are too many “bitter” first moms or adoptees out there. Can you understand WHY after reading this? These people don’t care about kids or families. They care about making a living off of adoption. They care about helping other people get what they want – a new baby – even if it hurts someone else. These people SHOULD NOT be adminning or running any kind of support group that involves expectant mothers or adoptees AT ALL. These people should NOT be guiding hopeful adoptive parents. These people are the epitome of everything that is wrong in the land of adoption. The reform that is greatly needed is because of people like this. If you can, in good conscience, remain active or supportive to this group you are only encouraging this behavior. May I suggest a different mixed group? One that welcomes EVERYONE’S experiences? There’s even a former admin from Domestic Adoption Support Network as an admin in here. She left after noticing many of the things I pointed out in this blog. In the meantime, I implore you to share this so others are aware. Shoot, even try to join it on principle alone to seek out those expectant mothers who are being told half-truths. That is the only possible reason I could ever see to stay within this horrid group. I was in that group and removed myself. I’m hoping to adopt and every time I posted anything I always got bashed. I noticed that happens a lot when you have a difference in opinion in that group. I seen it happen to many other people too. It seems to me of you don’t share the same opinion in that group you are wrong. It is in no way a support group. I could not even read the whole thing. I felt like gaslighting. So the human traffickers have reinvented themselves in Facebook groups. They have money to raise, right? I suppose this post is a little old to comment on but I do empathize with how frustrated you are. I felt a bit sheepish when I read your concerns about what qualifies the people as knowledgeable on the topic of adoption; I consider myself very knowledgeable on the topic because I really care about equal rights and as a free search angel reuniting families for 20 years I’ve learned that adopted people and their relatives have their rights reduced by adoption and that’s not OK. I am a very vocal activist against the legal inequities that occur when a person is adopted. There is no need to alter the first, middle or last name of a person just because their parents are unable to raise them. Parents loose custody all the time without their names being removed or replaced on the birth certificates of their sons and daughters. Nobody else should ever legally be referred to as the parent, mother or father of another person’s offspring. It’s entirely possible to raise another person’s son or daughter without being paid back by that person by forcing them to refer to their care giver as mommy or daddy. I’m absolutely convinced that states sell off the equal rights of minors in order to reduce the chances of the state ever having to provide support for that minor in the form of welfare and supplemental services. Parents should never have their parental obligations decreased just because they are not raising their offspring. Their offspring’s legal rights should remain intact as should their legal kinship within their own family regardless whether or not their parents loose or relinquish custody. That would be fair and equal treatment of all people born – zero reduction in rights of minors whose parents are unable or are unwilling to raise them. I could probably write a book or make money for reuniting people with family but the thought seems sort of gross to me. Then it would seem I’d need the thing I despise to exist in order to feed myself. I would love it if nobody ever needed my help again. They should not need help to find their own child, own parent, brother or sister. I’ve thought hard about what situation would make it acceptable for me to earn money doing this thing I love and I really have not come up with a scenario that I would not feel shady about. I even find it kind of off putting when people who are adopted or who’ve relinquished make money off books and tours but it’s not my world. I definitely don’t like the idea of seeing people profit off of adoption or donor conception books and trinkets. Whenever I approach parents to tell them that their son or daughter is looking for them or whenever I help a parent look for their son or daughter I’m very clear about proper language. I detest the terms birth mother, first mother, biological mother. A mother is a female with offspring…look it up in Webster’s Dictionary, her offspring are her son’s and daughters. There is no need for a prefix when your the real deal and there is no requirement in any language that a person raise their offspring to qualify as either a mother or a father. Raising offspring is something parents do, raising other people’s offspring is something adoptive parents do and something anyone can do but it does not make them the mothers or fathers of other people’s offspring. I always ask what a person’s real name is when I start to help them search. It’s my greatest joy to tell a person his or her real name if they never knew it before. It’s my intention to continuously refer to the person by their real name to reinforce that I’m addressing the person they actually are not who anyone else made them over to be. My opinions get me removed regularly from forums like the one you were removed from. I know your angry. I’m angry that anyone ever got you to refer to yourself as someone’s ex-mother. I’m angry that anyone would ever have the balls to tell your kid that real mommies kiss boo-boos and sew prom dresses and stay up all night with sick kids. All that intended to make their mother seem not real and like they owe it to their caregiver to refer to them as mom. That makes me angry. Your just a mother and in reality your the only mother of your offspring your their female source of existence. I’m really sorry that you did not have the opportunity to raise them to adulthood but that did not erase your motherhood. Nothing you or anyone else can do will ever reduce who you are in relation to your children. A truly compassionate society would help parents be there for their sons and daughters to whatever extent possible even if they cannot raise them every day because its what would make their children do their very best in life. I’m totally not a professional. My opinion counts like nothing but I just can’t ignore how terrible we treat parents who can’t raise their kids easily and how terrible we treat their kids by making them give up their rights in exchange for food and shelter when they are minors.